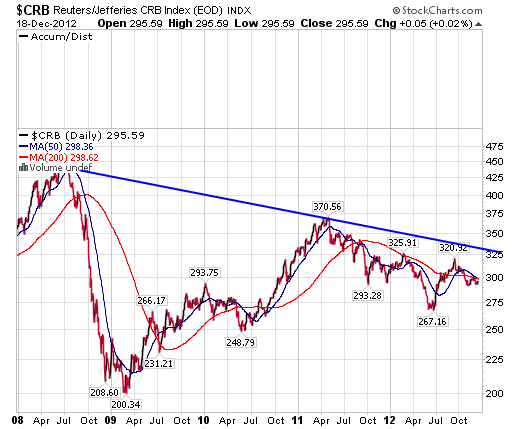 The five year chart of the CRB Index (a Broad Measure of Commodities Prices) shows three descending tops, which is suggestive of Deflation. But to conclude that Deflation is likely to be The Ruling Force in the Economy in 2013 would be a Dangerous Error. Indeed, it is critically important for Investors to understand whether or not we are in an Inflation or Deflation, or both (we later explain how this is possible). Failure to understand The Reality about Deflation and Inflation is likely lead to poor or even lethal Investment decisions. Here we explain The Inflation/Deflation Reality and indicate how to Profit. Indeed, Contrary Anecdotal Evidence from Increasing Food and Energy prices which many of us have encountered in recent years suggests we are in a serious Inflation. But if one takes a look at the very recent CCI numbers or at Inflation since, say, 1930 (immediately pre-Depression) one gets a very Different view. They indicate ongoing Price Inflation. The Solution to the Inflation/Deflation Conundrum is to consider whether there is Inflation or Deflation on a Sector by Sector basis. When one does this, one finds some Sectors are clearly Inflating and others Deflating, but that the overall Net Effect is Inflation (see below). 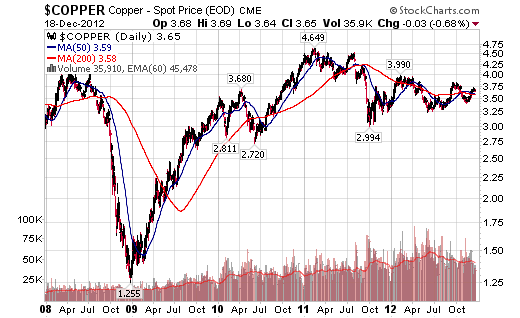 “Check out the chart of the Continuous Commodity Index or CCI and note that it has managed to put in a weekly close above the 38.2% Fibonacci Retracement Level of the move lower from its all time recent high made last year. If the market pysche remains the same, look for this index to now make an eventual run back towards the 597-600 level. We can look at these charts as subjects of interest to us as traders/investors but what this particular stock represents is increasing pain for consumers and the hard-pressed middle class in one of the worst, if not the worst "recovery" since the Great Depression. Think of this as increased frustration at the grocery store, at the gas pump, at the hardware store, at the local restaurant, etc. While some of this rally is the result of the drought and I will of course not lay that at the feet of the Fed, it is a simple fact that the breakout on this chart today, is the DIRECT RESULT of Mr. Bernanke's insistence on implying that another round of bond buying is on the way. It is not just the skyrocketing prices we pay for Food and Energy as reflected in the CCI, that demonstrate the Price-Inflationary effect of The Fed’s (and ECB’s) ongoing Monetary Inflation. But it is the prices for most of what we buy that have skyrocketed as a result of The Fed’s decades-long Monetary Inflation. Consider the following chart comparing the 1930’s cost in the U.S. for common goods and services, with today’s costs in Purchasing-Power-Degraded Dollars. And, regarding Inflation Prospects, perhaps most significant of all is the recent statement by the CEO of Cargill, the Giant Grain Trader. “…Greg Page, chief executive of global grains trading giant Cargill Inc, joined a chorus of critics of biofuels by urging the U.S. government to temporarily curb its quotas to produce corn-based ethanol fuel. Page said on CNBC that the U.S. biofuel mandate ‘needs to be addressed’ through existing policy tools. Otherwise, the spike in U.S. corn and soybean prices to record highs will ‘ration’ demand in ways that will hurt food production too much. “If all that is only on livestock or food consumers, it really makes the burden disproportionate. What we see are 3 or 4 percent declines in supply lead to 40 to 50 percent increases in prices, and I think the mandates are what drives that,” he said. In 2011, almost 40 percent of the giant U.S. corn crop went into making ethanol, and the United States still exported more than half of all corn shipments worldwide…. Clearly, the Food Sector has been, is and will likely continue to exhibit increasing Inflation. So The Answer to the General Question: Which is it, Inflation or Deflation? is “That Depends on the Sector”. Most important, however, is the net, which, weighing Inflating Sectors against Deflating Sectors, is Inflationary. Indeed, John Williams’ (shadowstats.com) Real Numbers (as opposed to the Bogus Official Statistics) confirm the foregoing (net) ongoing Inflation. The Reality is we are entering into a period of rapidly increasing prices in many Sectors, but in a contracting Economy with a NEGATIVE GDP of 2.10%. That is, we are in Stagflation, and if Williams is correct, and in our view he is, soon to move into a Hyperstagflation. It is most important to emphasize the Net Effect of Inflation in some Sectors and Deflation in others is that we are already Threshold Hyperinflationary overall at 9.41%. Thus proper Sector by Sector Evaluation and Selection is Critical when Investing in 2013 and beyond. Indeed, The Key for Investors is to play the Inflation Sectors to Inflate and the Deflating Sector to Deflate, and, generally, to Invest for Inflation overall. It is also important to see that much that is claimed about Deflation is a myth. Certainly consumer debt is not decreasing overall, as we demonstrated in an earlier Article. And the debt of most (already overindebted) Sovereigns is still increasing, except for that of Greece. And the ECB’s and Fed’s recently announced, de facto, QE to Infinity programs (with Japan likely to follow soon) are not deflationary, but rather quite inflationary and they will surely continue (see below). The increase in the Money Supply morphs into Price Increases as we are already seeing in Food and Energy and are likely to see in other Sectors in the coming months. The US economy is nose-diving again and the Fed is acting preemptively. The Fed is trying to provide increased liquidity going into the fiscal cliff. The Fed is funding the US’s Government massive deficits. Summers points out that the motivation regarding #1 is that the Economy is contracting again as the November ISM report shows. And the Big Banks are still not lending to Small Businesses which account for over 70% of jobs in the USA. Importantly, what Summers implies, but does not expressly state, is The Fed’s (and ECB’s) Main Motivation, that QE is aimed mainly at maintaining the Profits of the Mega-Banks, several of which are shareholders of the private for-profit Fed. In light of the foregoing, and especially The Fed’s and ECB’s and (probably) the BOJ’s QE to Infinity, the Mega-Trend is that we will likely see periods of intensifying Asset Price Inflation, in 2013 and beyond. But this Price Inflation will not necessarily reflect Value Inflation, because Price will be reflected in value-degraded (i.e. Purchasing Power Degraded) Fiat Currencies. Regarding Specific Recommendations aimed at Profiting and Protecting from Intensifying Inflation see Notes 1, 2, and 3 below. In this respect (but not others), Evans-Pritchard’s analysis of Major Sovereigns and Central Banks’ Actions is correct. “[They] …are actively driving down their currencies or imposing caps. The side-effects of this currency warfare -- or "beggar-thy-neighbour’ policy as it was known in the 1930s -- is an escalating leakage of monetary stimulus into the global system. So don’t fight the Fed, and never fight the world’s central banks on multiple fronts. …so let me hazzard that the S&P 500 index of stocks will break through its all time high of 1565 in early 2013 -- mindful though I am of flagging volume and a wicked 12-year triple top. The Shanghai Composite will continue its explosive rally as China loosens the spigot again. The Politburo is reverting to its bad old ways of easy credit for state behemoths, and an infrastructure blitz, with $60bn of fiscal stimulus as well for good measure. Reform can wait. The more that investors come to think another cycle of global growth is safely under way, the riskier it will be to hold corporate bonds, $8 trillion in the US alone. With yields priced for deflation, that bubble is dangerous to own on 10-year maturities. The money will rotate into equities and bullion, with China’s central bank driving gold through $2,000 at last. As a polar bear, I doubt that such a happy cycle is upon us. We merely have a rally within a structural trade depression. The headwinds of deleveraging will return with gale force. The glut of excess global savings that lay behind the great crisis of 2008-2009 -- and that has kept us stuck in the Long Slump ever since -- is still getting worse. The international trading system remains badly out of kilter. There is chronic overcapacity across global industry and not enough demand to carry a full cycle of economic expansion, or to reach "escape velocity" as they say these days. Until that changes, every global rebound is doomed to disappoint within a few quarters, and that includes the cyclical upswing of 2013. Japan’s new premier Shenzo Abe is sweeping into office like Roosevelt in 1933, commanding the central bank to do whatever it takes to defeat deflation, deliver 3pc NGDP growth, and drive the dollar-yen rate to 90. And the poll that matters most is the rising support for the Front National’s Marine Le Pen, champion of the French franc, already pulling even with Gaulliste rivals. Yes, the Eurozone is already suffering from Stagnation and incipient Inflation. And with the U.S. recently increasing Taxes but not cutting Spending, the U.S. is headed in that direction as well. “Neither the debt ceiling nor serious long-term spending cuts were addressed. The Key Takeaway from all the foregoing is that it is essential to identify which Sectors are Inflating and which Deflating and to realize that the net effect is Inflationary. And, make no mistake, the Fed, ECB, BOJ, and others will continue QE for the foreseeable future. Consider Jim Sinclair’s sound reasoning in response to some Fed Governors opinions they may stop QE in 2013. “The implication of stopping QE is so dire to the economy that it is in a practical sense impossible. When gold was being sold by central banks during the 1970s market announcements were made constantly with the bias to depress metals. There is no practical way that QE can cease here or in Euroland without a total and final collapse of the financial system. Just go back to the IMF report on OTC derivatives I posted this morning. If QE ceases, the US bond market collapses and the Fed must debt monetize all required debt, which means if QE stops, it starts up again immediately and in a crisis mode. Indeed Jeff Clark (Agora Short Report) correctly characterizes these Fed Governors comments, “That’s Funny.” Yes, “Funny” as in ludicrous.